Perhaps you're a startup that's just got it's first servers or cloud instances up and running, or perhaps you're a very big company that's been doing things successfully for years. In either case, you are probably very good at what you do. But perhaps there are some thing that you do not yet have the experience with, or don't have the time to research yourself. There is an incredible amount of information you can find online, about all kinds of subjects. And yes, you can become a guru on almost any subject, if you just have the time. But since you have limited time, why not hire me to help you? We can talk about your problem, and I can try to apply my knowledge to your problem. I'm good at talking, but I want to know how I can help you. What problems are you facing? Or do you just want to learn more about scaling, monitoring, alerting, troubleshooting, network, etc? We can discuss these items in general, or look at your application and see where there's more to gain. Perhaps you haven't had the time to enable your application for full IPv6 connectivity. I can explain to you how IPv6 works, the differences between IPv4 and IPv6, how to have a dual stack application, how to rewire your network or reconfigure your firewalls, etc. Perhaps you have an existing application, but it's not scaling really well. Perhaps we can look at your application's architecture together. Or perhaps your application can benefit from application accelerators such as varnish (a high-performance web cache / reverse proxy), high availability or load balancing using software like haproxy. I have years of experience with these software packages and the problems they were designed to solve. I can implement them, or train you on how to use them to their best advantage. Perhaps you have an application that is running fine, but you have no idea how to monitor the application. I can show you how to define infrastructure and application key performance indicators, and perhaps we can put these indicators in a graph for trend analysis, using tools like cacti, elasticsearch, etc. Perhaps you're interested in monitoring and alerting. You want to send your operators a text message when that server is down? Or when the number of items in the mail queue exceeds a certain threshold? Do you want to ensure all services are up, that you certificates will not expire soon, that you memory use isn't too high, that your number of reservations per hour is no less than x, and so forth? Do you really want to be in control of your applications? 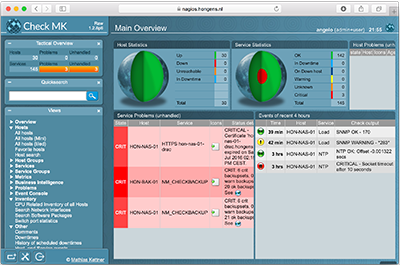 Uusing a tool like nagios, we can set up enterprise-level alerting in a very short time.You want to manage all your Linux nodes using puppet? No problem, I can show you how to do that as well. As you might have notices, all the tools I referenced here are open source, free tools. This means that if you want to implement these tools, no license fees or costs are involved, except perhaps the extra servers (or VM's), and the time we spend on installing them.